“I approached many landscape gardeners about my project, but only Paul seemed to understand what was really needed. My home was originally built in the 19th century as a Methodist Hall / Chapel and the conversion 30 years ago left the property with a very narrow, grim entrance passage and a very confined, high-walled terrace to the rear – all much neglected. 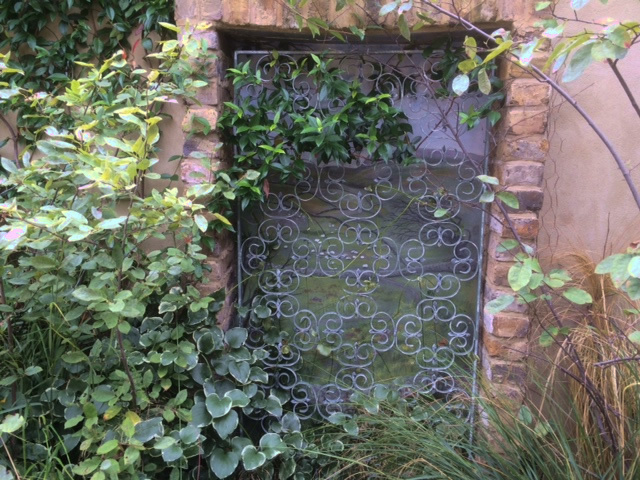 “I wanted to make the front garden and entrance welcoming, and for the rear garden to retain a flavour of its spiritual heritage as a safe place (my shorthand for this was The Secret Garden, Frances Hodgson Burnett). “Paul quickly grasped the concept, and was able to identify a very talented and experienced designer who did not find the challenge too daunting, and saw the opportunity to develop the area into an exciting, multi-faceted environment using the high walls in a positive way. With great attention to detail, the approach to my house bas become inviting, light and airy while the rear garden has become a sanctuary that no longer feels restrictive. “The planting is extremely beautiful, imaginative and varied, flowing from formal to woodland wild, and the beautifully rendered high walls have become a means to trap fragrance as the warmth of the south-facing aspect works its charm. “The fountain with fish enhance the peacefulness, while the trompe l’oeil and gate open up the area to suggest a beautiful world beyond. I also seem to have a lot more useable space for entertaining, and seating areas that allow me to enjoy both my early morning breakfasts late evening drinks in the sunshine.